Due to drastic budget cuts UXO/Laos has announced that it is laying off 200 employees, out of a total workforce of 1,200. Deputy Minister of Foreign Affairs Mr Saleumsay Kommasith told the media at a meeting of the UXO trust fund steering committee on Friday that 200 of the over 1,200 employees are being laid off. “These employees are having to leave UXO Lao because there is no money to pay them,” he said. According to the meeting, on the fourth anniversary of the Entry into Force of the Convention on Cluster Munitions last August, it was reported to international donors that UXO Lao would face shortages in funding and contributions towards the clearance of unexploded ordnance from contaminated areas by the end of last year. International donors were requested to provide more funds to UXO bodies in Laos so clearance work could continue in the provinces. The National Regulatory Authority then reported at a two day sector policy forum on the UXO survey in target development areas and UXO victim assistance in October that the number of UXO victims was within the Millennium Development Goal (MDG) No. 9 limit for 2015, but was still too high. Many people are still being killed or injured by the deadly devices each month. Mr Saleumsay said it was a challenge to source more funding from international donors for clearance operations. 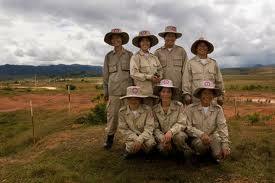 So far this year, donors have not confirmed they will support UXO clearance in Laos. Donors may want to know the plans for UXO clearance from now until 2017 as they may want to propose funding support from their governments. However, UXO Lao and other non-government organisations are set to undertake technical surveys of each area before starting any clearance work. It is hoped these surveys will show which areas of land need to be cleared and which others are free of UXO. This preliminary work will result in much faster clearance of large areas, releasing land more quickly for use or development. In the past clearance has been quite slow as they have been following a policy of clearing all areas m arked red on the map, which signifies the areas where UXO is thought to be. According to the National Regulatory Authority last year, over 44,000 hectares of land have been cleared since 1996. Up to 37 percent of the country’s total land area, about 87,000 km2, may be contaminated with various types of UXO.